What to Expect – Foot Changes During Pregnancy | Podiatry Associates, P.C. Posted on 11/25/2013Could There Be a Cure for Athlete’s Foot on the Horizon? ?What are the most common endurance sports injuries? Dr. O is phenomenal. I recommend anyone I can to her office. Harvest Y. New technology; professional and knowledgeable staff; beautiful office...I am very satisfied! Maxine R.
Dr. Classen explained every step to my recovery. Renee R.
Compassionate about her patients. Tom J. Very positive experience! Chris C.
Having a baby changes everything. Your schedule changes, your sleep patterns adjust, and even your priorities alter somewhat to take care of and accommodate the newest member of your family. Even before the baby arrives, though, moms experience plenty of changes—particularly in your body. This doesn’t stop with your growing belly, though. Your feet are affected, too. In fact, pregnancy changes feet both temporarily and permanently. It’s a fact of life that, as your baby grows, you gain weight. It’s natural and a normal part of the process. Your body does other things during pregnancy that prepare you for labor, including release hormones that are meant to relax the ligaments around your pelvis. This doesn’t just affect your hips, of course—the ligaments in your lower limbs loosen slightly, too. These are normal parts of pregnancy, but they can have side effects for your feet. The extra weight and loosened ligaments can actually flatten out your arch slightly. This can make your feet a little bit longer and wider, so it’s pretty common for expecting mothers to need to change shoe sizes. 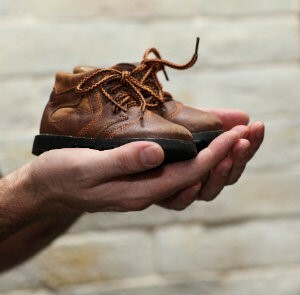 You might find your feet “grow” up to half a shoe size, and stay that way. A flattening arch can also cause some uncomfortable problems. You might find you’re more prone to aches and pains in your midfoot, or even in your heels. You may develop issues with overpronation as well. This can make it uncomfortable to spend a lot of time on your feet. Other foot changes are far more temporary, like issues with swelling and muscle cramps. Some basic home care can go a long way to making sure your feet stay comfortable throughout your pregnancy. If you’re expecting and noticing foot changes, know that this is normal—but you don’t have to learn to live with the pain. You can get help and get your foot comfort back. Our team at Podiatry Associates, P.C. in Castle Pines, Cherry Creek, and Parker, CO, are here to help you take care of changes and prepare for your bundle of joy without worrying about pain. Call (303) 805-5156 or use our online forms to make an appointment with us.